Be sure to register in our forums and post your comments - we want to hear from you! "Anyone who's used Panasonic's 14-42mm Micro Four Thirds zoom lens has probably noticed its relatively bulky design, especially when compared to Olympus's counterpart. Today, the company announced a new lens that offers the same zoom and f/3.5-5.6 aperture range in a housing less than half the size when closed, and still noticeably smaller when extended." I think the above photo says it all. The new 14-42 X-series lens is something Sony should have done with their NEX cameras to avoid the silly "small camera, huge lens(es)" problem. Both lenses have the exact same specification, that being zoom lenses with 14-42mm focal lengths, and maximum apertures of f/3.5-5.6. The differences come in the handling: The X-series 14-42 has no focus ring, and zooming is motorised, handled by a lever on the left side of the lens. The other difference is the price: The cost of the new lens is US$400, twice that of the larger lens's US$200. The lens will be available in October, and can be purchased as part of a new GF3 kit, called the GF3X, for US$800. The other lens is a smaller telephoto zoom, the 45-170mm f/4-5.6. Like the 14-42, there is a lever to control the zoom, but there is also a power zoom ring (think Minolta's ill-fated experiments in the early 1990's), as well as a focusing ring. 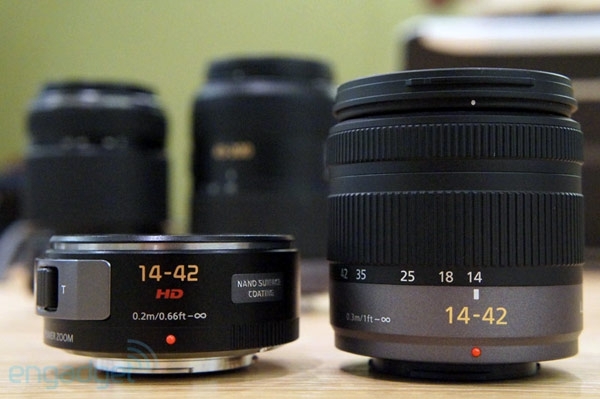 The 45-170mm will cost US$450 and will ship in September. Personally I prefer the older 45-200 at US$350. It might be a bit bigger, but once you reach beyond a certain size, any space savings seems a bit futile. Photos of the 45-170mm and the 14-42mm at the source. Social networking icons by Komodo Media.